Business Council Chair, Sabine Pittrof, was invited to a dinner with Sen. The Hon. Mathias Cormann in Frankfurt on 3rd July 2017. The evening was organized by Federal MP Volkmar Klein, who chairs the German Australian New Zealand parliamentary group. Mr Klein had invited a number of companies from his electorate with business dealings in Australia. In addition, there were some German bank representatives that are active in Australia. Attendees enjoyed listening to the various success stories in an informal atmosphere. It was a great networking opportunity and may also result in additional members for the German Australian Business Council. 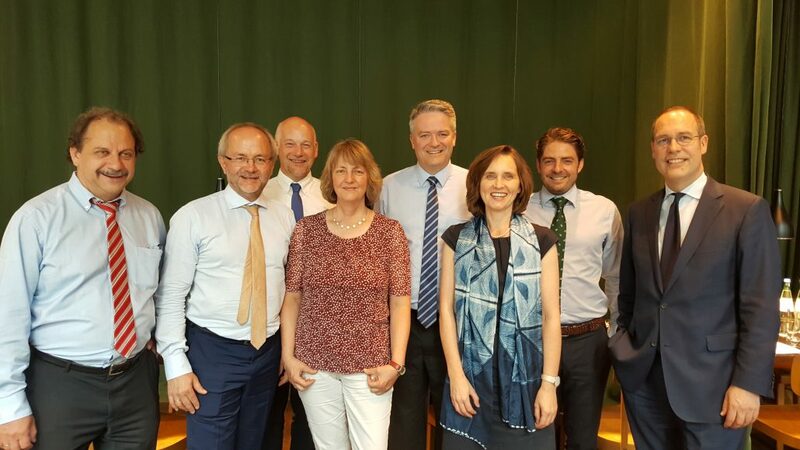 The photo shows Volkmar Klein and delegates from the Siegen-Wittgenstein electorate with Minister Cormann with Business Council Chair kindly invited to join the photo.